EBay for iPad lets you make offers based on the TV program you're watching. Not much happening this week as the tech world winds down for the end-of-year holidays, but here’s one story that caught my eye. EBay knows that one screen isn’t enough for us now. As more of us watch TV with tablet or smartphone in hand, the massive auction site and online retail aggregator doesn’t want to be left out of an opportunity to make a sale. So it’s created a feature for its iPad app called Watch with eBay that ties offerings in real time to whatever show you’re watching. Kevin Woodward at Internet Retailer has the scoop. Watching the Packers? Once you’ve keyed in your zip and carrier information, you’ll get a screen of green-and-gold logo wear. Viewing another Rooney Mara interview? Maybe you’ll see offerings from H&M’s Lisbeth Salander line. 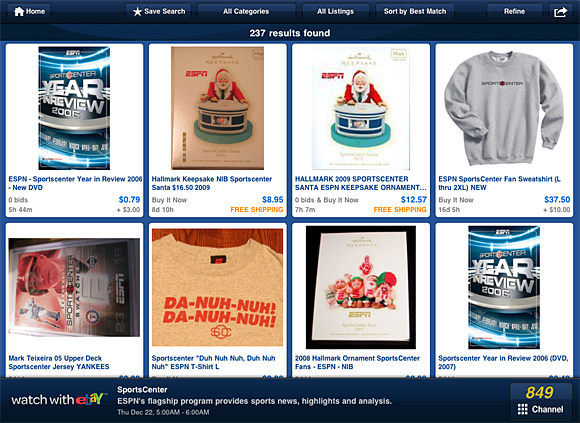 The Watch with eBay function within eBay’s iPad app shows products related to whatever television program you’re viewing. All I can say is it’s about time this happened. Just to bring some perspective, the first time I wrote about this possible feature — seeing something you like on TV and clicking to buy it — I drew my example from the hottest program on TV at the time: If you like Kramer’s retro sweater or Jerry’s pirate shirt, just click to buy. It didn’t happen then; the integration with set-top boxes never reached that deeply. But by disassociating the purchase process from the broadcast itself and running it in a parallel channel (the iPad) that we know is being used to supplement TV watching, eBay might be on to something. The related data will be worth watching. We know anecdotally that multitasking on the iPad is more comfortable than it was with a laptop (with a lot less heat dissipated into our thighs and other parts). But as yet there appears to be little data on just how much parallel surfing is occurring. EBay’s early results should provide one interesting data point. Commerce Weekly will return on January 5, 2012.